Product Type: Brodit Active Car Cradle Holder With Cig-Plug. Fitment: Tait TP8100 For All Countries. 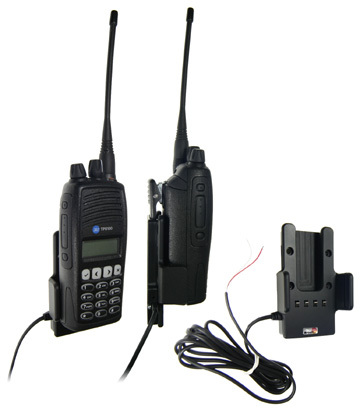 Are you using a two-way radio every day in your work? Then a Brodit active holder will make your days much easier! By keeping the device in an active holder, you will always have it within easy sight and reach while driving between jobs. Not only that; the holder also supplies a fully charged battery at all times. The active holder has a unique slim design with the charging box integrated in the holder and LED indicator to show that charging is in progress, the indicator changes from red to green when fully charged. Attach onto a ProClip Mounting Platform. Input Transient Protected: Withstands +150V & -450V. A 2,5A fuse is mounted on the incoming supply. Output Short Circuit Protected : The charger will supply a maximum current of 2 A which protects both the charger and the connected equipment. The current limit is set to standards of the producer and shall not be higher. For fixed installation. Slim design with charger integrated in the holder. For use with Li-Ion or Li-Poly batteries. Are you using a two-way radio every day in your work? Then a Brodit active holder will make your days much easier! By keeping the device in an active holder, you will always have it within easy sight and reach while driving between jobs. The cables are to be connected inside the dashboard, this gives a discreet, neat installation without cables hanging over the interior. The charging device is integrated in the holder itself, so there is no large charging box on the cable and LED indicator to show that charging is in progress, the indicator changes from red to green when fully charged. 12/24 Volt. The product is E-approved. Connect the power cable with a 2 A fuse. 2 A charger. Professional installation recommended. Attach onto ProClip Mounting Platform. Brodit - with More Than 20 Years in the Business! Brodit was conceived back in June 1983 as its founder Ebbe Johansson was sitting in his Taxi and had the vision of talking on the phone while driving without having to pull over. Some of you still remember the mobile phones from back then. They were not as neat and handy as they are today. They were more like suitcases weighing about 40 pounds with receivers as big as a brick! Ebbe saw the need for an easy way to have the receiver installed close to the driver's seat in order to use it comfortably. As a result, the ProClip was born, which is still the market leader for mounting platforms for communication equipment in vehicles today. Since then, many thousand different models and solutions have been developed for just about every vehicle in the world. Easy installation is one of the objectives, and another is not having to drill holes or in any other way damage the interior of the car! Brodit also produces holders for PDAs, mobile phones, GPS devices and multimedia monitors, but the ProClip is still Brodit´s main product. Read more information about Brodit.